Back with another hot off the press chapter of the guide this month, and also by popular request from more than a few readers, it’s time for the full Chromacoma guide to shooting in and around Chinatown, Bangkok. If you want to shoot pictures of Thai-Chinese or Sino-Thai people or life in action, you can do it pretty much anywhere in Thailand. The percentage of Thais with some Chinese blood in the family tree is absolutely massive, and probably a majority of the population of Bangkok can lay claim to this. Chinatown is simply a close knit epicenter of such people all living in a very tight area who have probably had their roots there the longest. It’s the real heart of the Thai-Chinese community and offers a really nice and visibly different little flavor to the Bangkok mix. It’s a good spot to try and catch some very ‘National-Geographic’ –esque sort of shots, if you know what I mean. Cliches here are also rife for the same reasons. On a recent shoot there, I even took a photo of part of a tuk-tuk (and a monk), usually these motifs are off-limits to me (as a resident here) as otherwise trite stereotypes but to be fair… it’s all justified by the plot somewhat down in Chinatown and you just get swept up in the flow of it all sometimes. Indeed, I thought it might be good to go into some detail although this one is definitely a bit trickier than usual this month as it covers a pretty large geographic area and is that much harder to pin down to a simple ‘right vs wrong’ way kind of approach. As if such a thing really exists anyway. This is just a recommendation and some tips as always. With that statement firmly in mind however, I would still like to introduce you to ONE way of doing Chinatown that I think should prove photographically rich in terms of opportunities. This is an approach that I have used myself several times and I think it might be a nice way for somebody not familiar with Bangkok (or perhaps just even the area) to try as a photographic adventure. To start with, I’m going to ‘flip the script’ (or whatever the cool kids say these days) and start at the back, from the river end with a loop and few suggestions before taking you back that way. Yes, that means starting your little Chinatown photographic sortie from the river boat (regular readers will probably already be aware that I like being on boats on the Chao Praya river). You will need to get to pier number 5 (N5) AKA Ratchawong pier. This is north of Saphan Thaksin (where the BTS skytrain meets at the river boat terminal there) by a few stops and south of Wat Arun by a similar distance. The orange flag express boat stops there (but only if there is somebody waiting at the pier or you make it clear that you are heading to the back of the boat to disembark there before it gets close!) as does the tourist ‘hop on-hop off’ boat. Although it is something that I am somewhat loathe to include within these chapters, I feel it is particularly hard to cover this without the inclusion of an actual map so here it is. Allow me to explain it and read these words carefully before you look at the map in detail. The arrow markers I have laid out are MERELY A SUGGESTED OUTER BOUNDARY route that I highly recommend you to follow. However the key idea here is that you should randomly pick and choose to cut through as many alleys, back ways and side streets that link through to this main outer perimeter walking route outlined below as possible. If you just follow the arrows, everything will be fine but the real joy of discovering Chinatown is all the little hidden cut throughs and what they have in store for you. It would be a shame to miss them. This might seem like an odd way of doing things, for example somebody might well wonder why I haven’t got an arrow going straight down Yaowarat Road, as the main artery of Chinatown. The route I have actually allows for you to shoot looking down it but a lot of it looks the same and once you have walked down the first hundred metres, the next few hundred don’t look much different. However, the side streets and alleys that hook up and link this main road to the outer route I show on the map are all really varied and eclectic with lots of stuff to see that is well worth exploring just ever so slightly off the more obvious main routes. That’s kind of the point. To highlight the kind of technique I mean. I have given a little example early on in my map here to start you off. Once you disembark at the pier, follow the people the obvious way out to the first street you emerge out into. There will probably be a few Bangkok buses strangely parked up there on the left and a tuk-tuk or two on the right. If you walk up that road just a little way to the first left turn and walk down that way….you’ll find tiny little alleys off to the left with real Chinatown slices of life lying in wait for you. Some of the entrances look so small and dark that you would be forgiven for thinking that you are not allowed to enter them but you’ll see the odd person popping in and out of them here and there and it soon becomes clear that you can explore further. Some of them are even functioning as street restaurants, out of the sun and heat. The people will certainly not be expecting to see you but as a foreigner with a camera in hand obviously wandering around ‘semi-lost’ taking photos, they’ll ignore you soon enough and if you just smile…you’ll be fine. Just behave respectfully as always. Then follow the arrows back down to the main road where you started, take the first left back up Ratchawong road and you’re all set. This is the kind of zig-zagging that I am talking about. I am merely giving you a basic map route to try and keep heading along otherwise you could just zig-zag yourself into nothingness or get stuck, miss the main sights and sounds etc. You get the idea. Carry on like this in such a fashion, follow the general arrows and make little detours off to the left and right following your senses. Feel free to ‘cut through’ and miss out a section if you wish, but just at least stick to the general arrows and direction all the way around. It’s great fun and the ‘deeper’ you go, the less tourists you’ll see. Film shooters are gonna be needing some flexible ISO’s as the bright/dark contrasts can be a challenge for any camera or photographer. It goes from barely being able to clearly see inside an alleyway to Ultra Sunny f22 in a heartbeat and often within the same frame. ISO 400 at minimum would be best, only go higher if it’s a murky monsoon season kind of day. Normal lenses work fine but a bit wider isn’t a bad idea with so many people and places dying to be squeezed into frames everywhere you turn. You’ll no doubt see that it’s basically a loop that will eventually circle back around to the same pier (N5) and then you can decide which way to hop back on the boat from there. 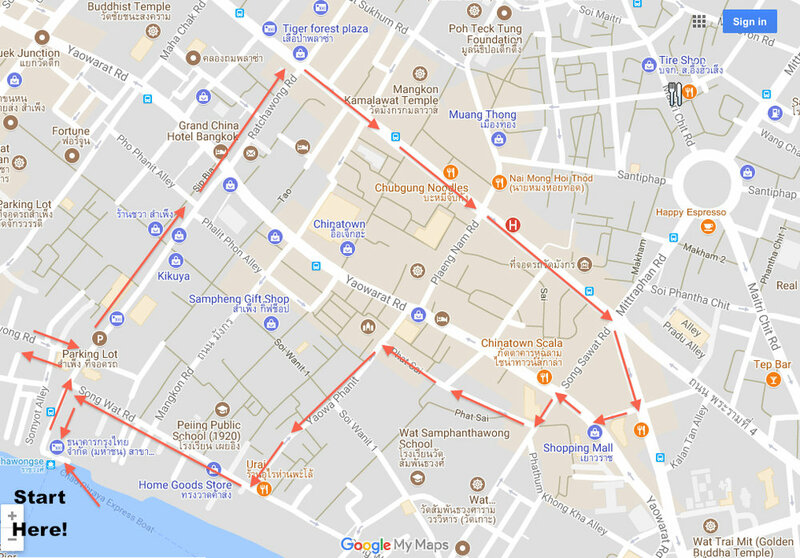 The reason that I am suggesting this is that most tourists will be starting at the other end of the Yaowarat road and probably being accompanied by a tuk-tuk ‘guide’ (cough). I saw a lot of these the last time I did this loop. You can always tell as the 7/11’s down that way have more foreigners in, often overly laden with backpacks and briefly enjoying the free air con whilst buying fluids. The ‘guides’ are often hanging around waiting for them outside. I think you’ll do better photographically to be a little further away from that, at least until you are nearing the end of your expedition. If you’re a market sort of person, be advised that there are some great markets inside this loop, including Sampheng (day and night versions) but be very careful of your belongings and bags/wallets if you are gonna be deeply absorbed in taking shots in such places. Good people watching and photo opportunities there though for sure. That is about it. It is certainly not the only way to ‘do Chinatown’, photographically speaking, but it’s definitely not a bad way to start. There will always be too much here to shoot it all, life moves fast in this part of town so try and catch what tiny, but hopefully beautiful, little moments of it you can.